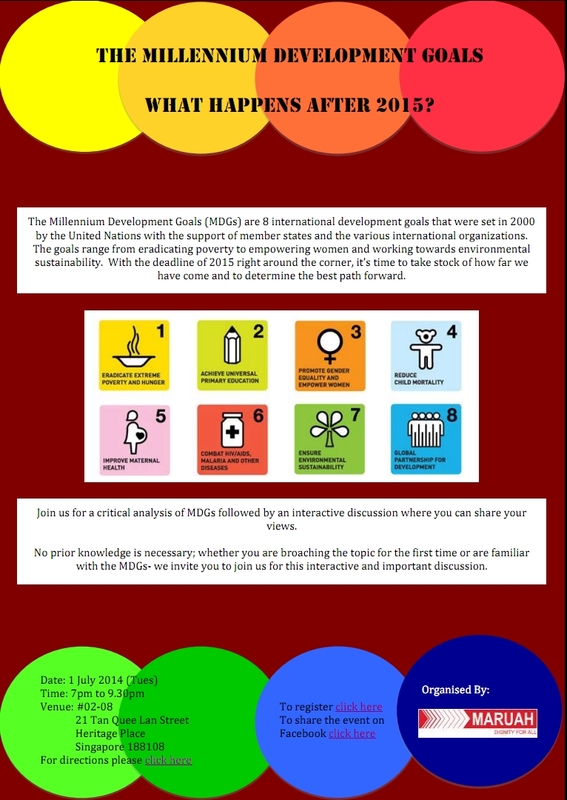 The Millennium Development Goals (MDGs) – What Happens After 2015? MARUAH invites you to join us for an interactive discussion on the Millennium Development Goals (MDGs). The MDGs are 8 international development goals that were set in 2000 by the United Nations with the support of member states and various international organisations. The goals range from eradicating poverty to empowering women and working towards environmental sustainability. With the deadline of 2015 right around the corner, it’s time to take stock of how far we have come and to determine the best path forward. Join us for a critical analysis of MDGs, followed by a discussion where you can share your views on the topic. No prior knowledge is necessary; whether you are broaching the topic for the first time or are familiar with the MDGs; we invite you to join us for this interactive and important discussion. The Millennium Development Goals: What Happens After 2015? This entry was posted on Thursday, June 19th, 2014 at 10:01 pm and is filed under Events. You can follow any responses to this entry through the RSS 2.0 feed. You can leave a response, or trackback from your own site.